Below, you can go through each slideshow and view side by side the different color combinations to get an idea of how your Stitch Nerd Pressing Mitt may look. Choose one Liner fabric swatch, one cotton swatch, and one wool swatch to create a personalized item that reflects your taste and personality. Questions about the fabric weight/thickness? Do not hesitate to ask. I am always on a quest for unique fabric so check back often as I will be adding to the current stock. 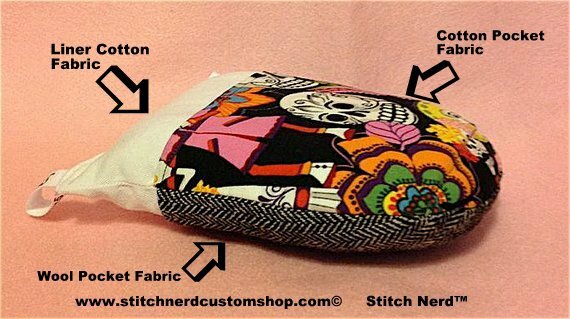 How do I order a Stitch Nerd Pressing Mitt? Customization is easy! Two (2) sizes to choose from: Regular and Large. Choose 1 Liner fabric (solid color) - if you prefer a different fabric than that in the slide show, send me a note. Choose 2 outer pocket fabrics (one wool & one cotton) - from the selection below (scroll down the page to view slideshows). You can put your cursor over the fabric swatch to scroll through all the choices. Jot down the swatch numbers (C# & W# shown on each photo) of each so that you may enter them in the box at checkout. Go to the BUY tab and Click on Pressing Mitts product photo. Select the pressing mitt size, then Add to Cart, and enter your fabric choices in the "Note to Seller" box at checkout.